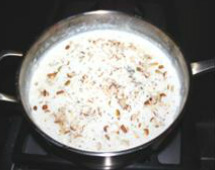 ﻿R﻿asmaili is one of the most popular delicious sweet dishes of India. This amazing dish is prepared with milk. 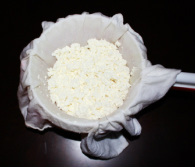 The milk is first curdled and the chhena (paneer or cheese) is collected and why is drained off. 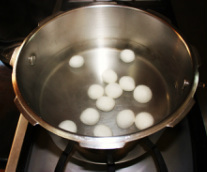 It is then made into small balls and boiled. 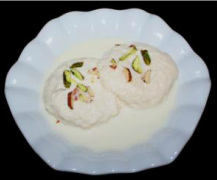 These balls are then soaked in sweetened, thicken, creamy milk flavored with rose essence and garnished with almonds and pistachio nuts. mouth. You will definitely fall in love with this sweet in first bite. 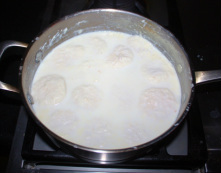 Ras malai is either white in color or yellow. It gets the yellow color if saffron is added for flavoring. 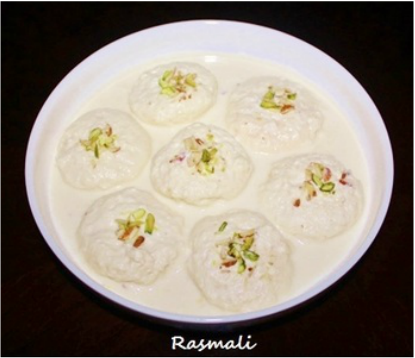 Ras Malai is usually served during many festive occasions and as a dessert after the main meals in Indian weddings. It is usually served chilled. 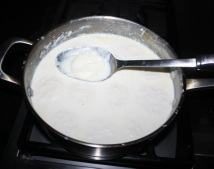 Ras Malai can be made easily at home, the recipe of making the Ras Malai may look difficult and lengthy but it is easy to make. 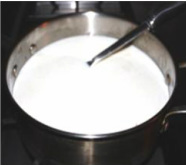 keep string periodically as milk tend to burn from the bottom. will spill out of the pan. in the milk,turn the stove off. 1. 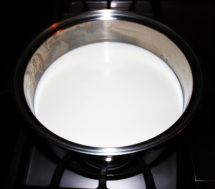 In a big stainless steel heavy bottom sauce pan boil 8 cups of milk on low heat, with a cooking spoon stir periodically because milk tend to burn from the bottom. 2. 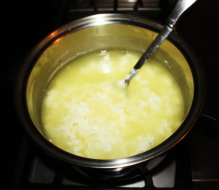 Once the milk come to a boil, add the lemon juice little at a time and keep stirring, until milk start to curdle and separate from the whey. Turn the stove off and let it stand for about 15 minutes. 5. Lift the cloth off the colander, gather up the ends and twist and squeeze to drain the water out of the chenna, or gather the edges of the cloth and fold them over to cover the chenna and place it in the colander and fill a heavy pot with water and set directly on top of the cloth wrapped cheese in the colander and leave it aside until all the water drain out. 6. Once all the water drained out, take the chenna out from the cloth and place over the counter or rolling board and began kneading with the heel of your hand. 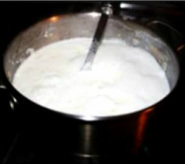 If you have a very moist chhena, when you mash the entire chhena will get stuck to the counter but if you have nicely squeezed chhena then as you mash by dragging your palms, your palms will automatically get greased by the fats from the chhena, which aids you to mash and smoothen it better. In case your chhena has become too dry or too hard add few drops of water to make the chenna smooth and soft. You could also use rolling pin to mash the chenna. 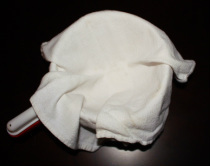 wrap the chenna in a towel and leave for a while, towel will soak the water. cheena and make it like a dough. 10. Divide the dough into 16 to 20 equal parts without making the balls. 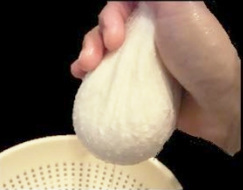 Take a portion of the dough and roll it in between your palms in to a ball without any cracks, or over the rolling board roll them in circular motion and make a smooth and round ball. 11. 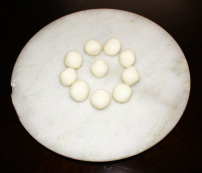 Some rasgullas do not appear to have a smooth outer appearance because they may not have been pressed and mashed well, then each time you roll the cheena mash the cheena with the thumb in the pam and roll until you form a round ball. 12. Now with your palms press the ball gently and make it like patties. There should not be any cracks in the patties otherwise they will break while boiling them. 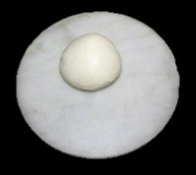 the dough and mix and knead to make it soft. 15. In the 4 quart pressure cooker add 6 cups of water and bring to a boil. 20. 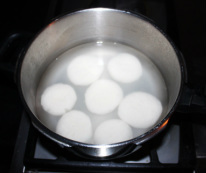 Once rasugllas cool down then with a slotted serving spoon lift one rasgulla at a time and transfer them into the pre made thick milk. Repeat until you boil all the chenna patties. 21. Once you boil all the patties and transfer them into the milk, then place the pan over the stove on low heat, give a boil so that patties absorb the milk, turn the heat off and add rose essence and half of the sliced nuts and mix. 22. Once Rasmali cool down transfer them to serving bowl and decorate them with other half of sliced almonds and pistachio nuts and place them in the refrigerator. Serve them chilled. 1. 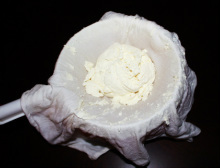 Food processer could be used to make the chenna soft. water and cook thoroughly and they stay white. each other and would not have enough space to expand and remain hard. not be able to make smooth balls. 1. 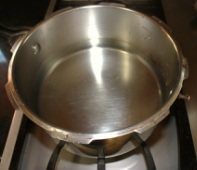 Take a big sauce pan and add 6 cups of water and bring it to boil. 20 minutes on medium heat, turn the heat off. milk and repeat until you boil all the chenna patties. 4. 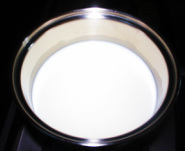 Once you boil all the chenna patties and add them into the milk, then place the pan over the stove on a low heat and give a boil so that patties absorb the milk, turn the heat off.